Stickers - Using stickers is a nice way to add a little bit of branding to an otherwise ordinary object. 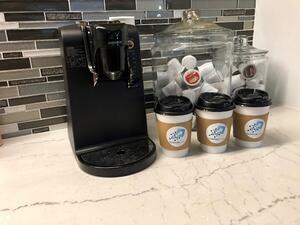 With the help of large format printing technology, we've created stickers for coffee cup sleeves, swag bags, decals, and other promotional items. Who needs to order customized stickers when you can make them yourself? 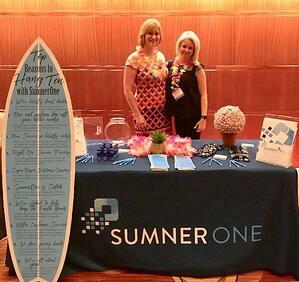 SumnerOne Surf Board - We used our printing technology to create a surfboard-sized display for a networking event. Our creatives designed the board and filled it with 10 facts about working with SumnerOne. The life-sized cutout was a great conversation piece to get visitors at our booth talking for the beach themed event. A visitor to our booth even asked to take it home! Truck Wraps - One of the biggest advantages of printing on a large format device is how grand the scale of your project can be. Our KC warehouse was in need of a revamped truck wrap design, and our printing capabilities came in handy. While we needed to outsource to the professionals for the installation of the wrap, we handled the printing of the design in-house. 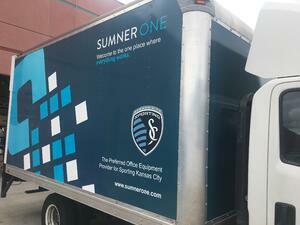 Our updated SumnerOne truck wraps can now be seen all across the Kansas City area and speak as a portable testament of what our printers can do. Worst Copier in KC Banner - Have you heard of our annual Worst Copier in KC event? Each year we drop KC's worst copier from a 120 ft crane for charity! Obviously, an event like that requires some awesome signage. In 2018, we made a 60 ft banner on our wide format printer that hung from the copy machine that won the contest. Outsourcing a banner of that scale would have been cost prohibitive, but the technology we have available made it possible. Our 2018 Worst Copier in KC event was a smash! Stay tuned for updates, we're expecting to make 2019 a big hit too! Elf on the Shelf - Our marketing team wanted to join in on the Elf on a Shelf trend back around the holidays and created an entire social media campaign with our new friend, Peppermint. 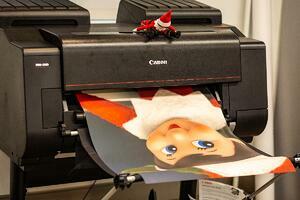 Our silly elf found herself using our Canon imagePROGRAF to bring her "sElfie" to life on a larger scale! This fun photo op made for a silly social media post and gave us something to remember Peppermint by until she returns from the North Pole next year. 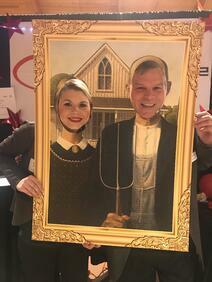 Portraits - Our Southwest Missouri office, Corporate Business Systems, attended the Joplin Business Expo early this year. The theme of the event was, "Portrait of Innovation" and we found a way to get creative for social media yet again. Our creatives took famous paintings and made head-in-the-hole images for the people who visited our booth to interact with. We paired the fun photo-op with a social media contest and got to use our wide format technology to make this happen. Skyline Wall Cling - Showing off your city is a great way to add local flair to any office space. Our Kansas City office did just that when they wanted to add some artwork to their demo floor. 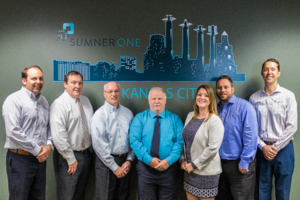 SumnerOne produced a large wall cling of the KC skyline to go on display. We've made plenty of stickers before, but producing one giant detailed sticker on our production equipment was a step up in the game. Demo Floor Stands - A few years ago, we remodeled our St Louis demo facility and as a result, needed to upgrade our display to allow us the flexibility to rebrand as new technologies needed to be showcased. We purchased lightweight four-sided portable display tables and printed our panel graphics mounted on foam core that can easily be changed for vendor events or to promote specific technologies as needed. The tables are easily transported to in-person vendor events if needed and we can tailor our display to fit a theme or need. Being able to change branding on demand means we can create multiple displays for products or events in just a matter of hours. 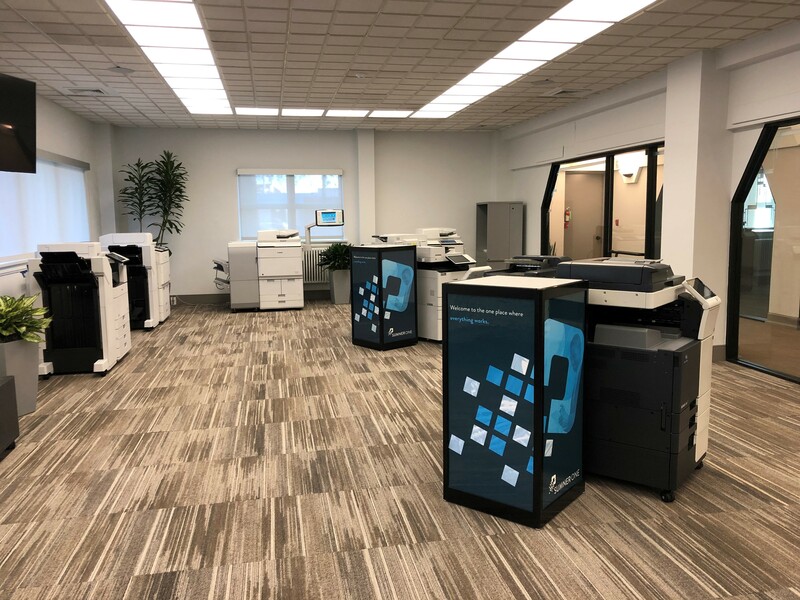 Our Production Print Specialists are ready to help your business to get the creative process going on your next project with the latest technology available. 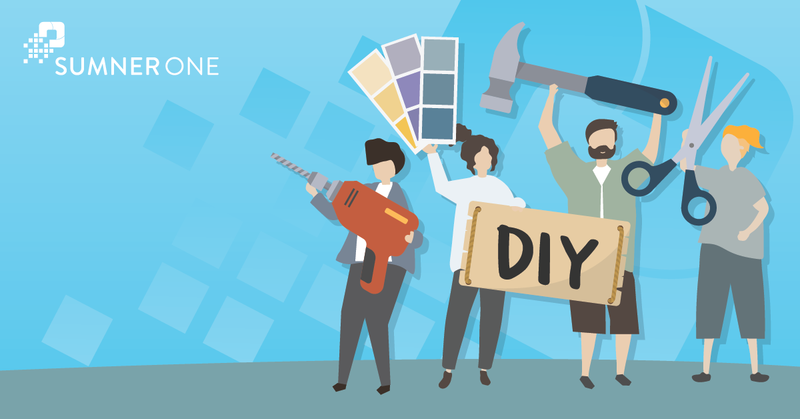 If you would like to learn more about how SumnerOne can help your business to create one-of-a-kind projects with large format technology, contact us.